The Elliot Hospital Neonatal Intensive Care Unit (NICU) is located on the fifth floor of the hospital. 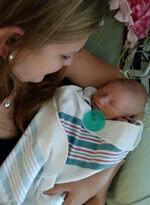 As you enter the NICU, you may find yourself in a place that is different from anywhere you've ever been. The unfamiliar sights and sounds of high-tech medical equipment may be overwhelming. Both you and your baby are experiencing a new world for the first time — together. To help you through this journey, Elliot’s NICU team is committed to providing superb care specific to the needs of you and your baby. So, while we work tirelessly to ensure that your newborn grows and develops properly, you'll be able to witness his or her young life unfold right before your eyes. In stages, you will be able to hold your baby, feed your baby and be a partner in the care of your baby, right here in the NICU. Our state-of-the-art facility houses 26-beds (isolettes), where we treat more than 400 critically ill and premature infants each year. Here, in a nurturing environment, our special patients receive the comprehensive personalized care that allows them to thrive. “My daughter was born with a rare birth defect. As I watched the doctor and nurses take my daughter, all I had left was hope and trust in the Elliot team. We laid our daughter in the arms of Dr. Soukup, the pediatric surgeon. That was the hardest thing we as parents had to do. The surgery was successful. No one can prepare you for the NICU life. It’s a journey and a world of hope and patience. Not everyone will understand your journey, but know all the parents in the unit will understand the roller coaster of emotions you encounter. Thanks to the staff you can vent your emotions. They will only comfort you more with strength. Make your gift to support the caring work of the Elliot Hospital NICU – Donate Now!